New York City is famed for numerous delicious treats, such as deli sandwiches, bagels, and even dim sum. Nonetheless, you would not want to forego an opportunity to taste several of New York City's rightfully famous pizzas. 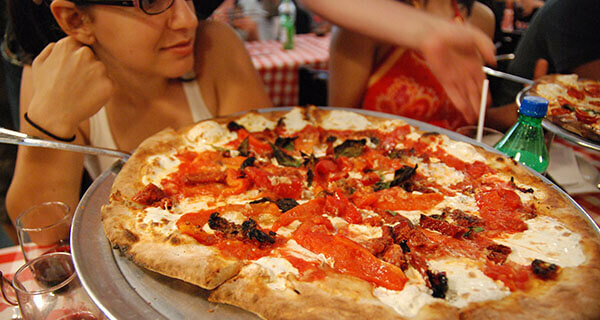 Although there are stands where you can pick up a quick slice on almost every NYC street corner, below is some of the greatest pizza NYC has to offer, sent over by our friends at Hostelbookers.com. This pizza joint offers an exceptional coal oven pizza that is truly worth waiting. This explains the long queue of customers waiting to get in! Luckily, the line outside the shop moves faster than you would imagine, and the pizzas are served right away once you are seated inside. Don't miss to take a post-dinner walk down the bridge to experience the magnificent sight of Manhattan's skyline. Though Grimaldi's Pizzeria is certainly worth the visit on its own, it is a truly great prize after strolling across the Brooklyn Bridge plus a great choice nearby Pier 1 at the famous Brooklyn Bridge Park. Initially opened in late 1930s; L&B Spumoni Gardens is famous for its Sicilian pizza, spumoni, and ices. L&B Spumoni Gardens has a casual outdoor seating and a much more formal inside the dining room with a complete menu of traditional red-sauce Italian dishes. With lots of space for running around and many high-chairs available, the ambiance here is very family inviting. This Brooklyn pizzeria is famed with nearby residents, along with pizza lovers who don't even mind the subway ride. Among the finest pizza in NYC, Di Fara's Pizza in Brooklyn provides both traditional and square pies, which is in addition to a list of classic Italian cuisines. One of the great aspects of eating pizza at Di Fara's is seeing Dom De Marco create each pie by bare hands. The toughest part is of course the waiting since you need to wait in quite a long line, and the pie is delivered piping hot, so you really need to wait even more once you get it. Established in 1905, Lombardi's Pizzeria claims to be America's very first complete pizzeria. Checkered table covers as well as the black and white photos hanging on the decorated brick walls give an excellent backdrop for enjoying one of the finest coal oven pizzas in the city. Though all the pizzas at Lombardi's are delightful, the clam pizza with whole clams giving enough salty punch to the luscious pie is really a special treat. Originally located in Forest Hills, Queens, Nick's Pizza also has an outlet on the Upper East Side that offers crisp and thin-crust pizza. Nick's Pizza, which is established in 1993, uses a gas-fired furnace to make their pizza. Nick's Pizza also offers delightful cannoli for dessert. Totonno's Pizzeria has been creating excellent coal oven pies since 1924. An excellent dining stop if you are in Coney Island or New York Aquarium. Busiest during summer, you will find waiting times much shorter at Totonno's Pizzeria in the winter days. Although the Manhattan branches cannot match the the original in Coney Island atmosphere, you won't be disappointed with the brick oven cooked pizzas offered at any of Totonno's locations. 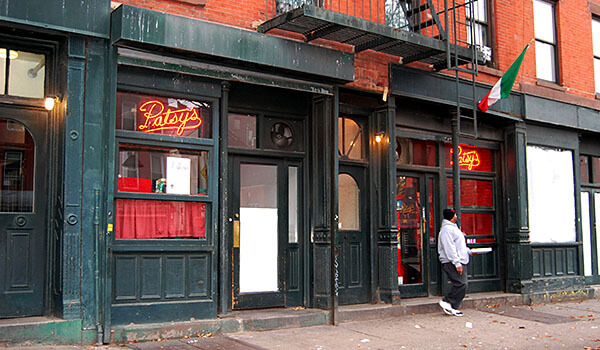 Its original East Harlem outlet has been opened since early 1930s, and it still serves delicious pies from its coal oven to customers in historic East Harlem. Customers have the choice of either getting a quick slice of pie from the to-go counter in Patsy's, or sitting down to get pizza in the modest dining area with red-checkered table covers. One of the newer pizzerias in New York, Motorino Pizzeria Napoletana serves exceptional Neapolitan-style pie at its branch in the East Village. The East Village branch is very famous, so you have to be ready to wait in line if you go there during peak hours. 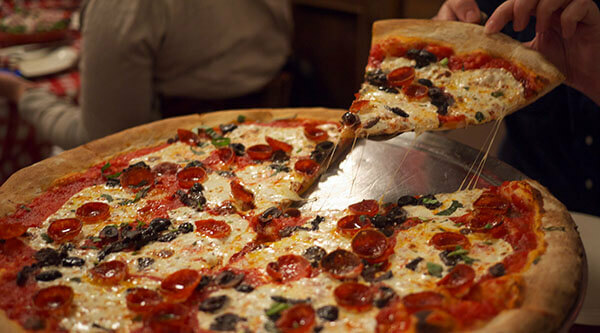 The best pizzerias outside Naples are found in New York City, and if you're not going for a 'pizza pie' while visiting you've missed the best part! Last updated by jack on 08 April, 2013 in Food And Drink.